Star Tours was the second* collaboration between filmmaker George Lucas and the Disney theme parks, and the first ride based on Star Wars. Employing a squadron of hydraulically-powered simulator cabins in synchronization with a four-minute special-effects film, it sent its passengers on a raucous galactic vacation piloted by a cheerful, hapless droid named Rex. It was a sort of Star Wars “greatest hits,” with a dangerous flight through ice asteroids, an encounter with an Imperial Star Destroyer and a climatic trench run against yet another Death Star. 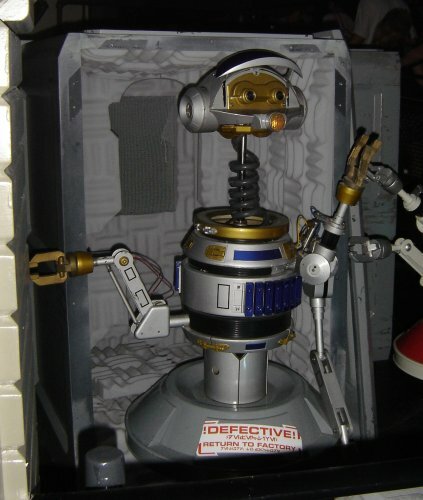 I was fortunate enough to be living in Southern California in January 1987 when the original Star Tours ride opened at Disneyland. In celebration, the park stayed open for 60 hours straight, and I was there for much of it. So it was fitting that I just happened to be visiting Orlando the week prior to the official unveiling of the rebooted Star Tours at Walt Disney World this past Friday. The circle is now complete. 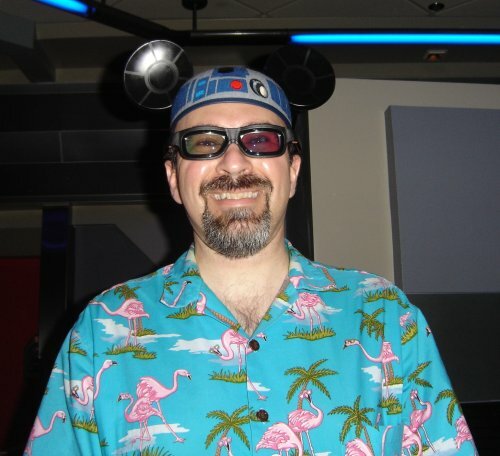 Rocking my R2-D2 mouse ears, sporting some 3-D "flight goggles" and generally looking like the hugest dork in Dorkville. I’d originally intended to wait a day before visiting so as to avoid the crowds, but my friend (and fellow Disneyphile) Sherri talked me into attending on opening day itself. I’m glad that she did. 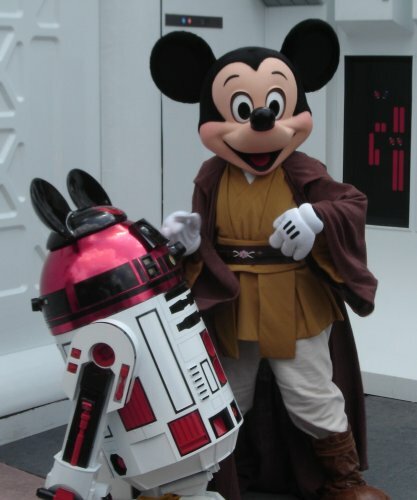 There was a massive Star Wars hootenanny going on throughout the Disney Hollywood Studios park, with costumed characters everywhere and more than a few foolish fans who wore their Jedi robes in the 90+ degree heat. There were several “celebrities” in attendance in additional to the inevitable Anthony (C-3PO) Daniels. Young Boba Fett! The voice of Ahsoka Tano**! Some other people! I would have made a "these aren't the droids you're looking for" joke, but the Stormtroopers beat me to it. I didn’t see George in person this time***, but a video screen near the ride queue displayed the opening ceremony. 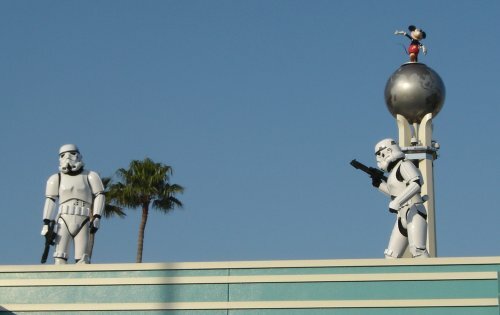 It kicked off with a silly bit in which two hooded Jedi fought their way through a horde of Stormtroopers and blasted the force field encapsulating Star Tours, only to be revealed as Lucas and Disney president Bob Iger. George went on to cut the line in front of me, the fucker. 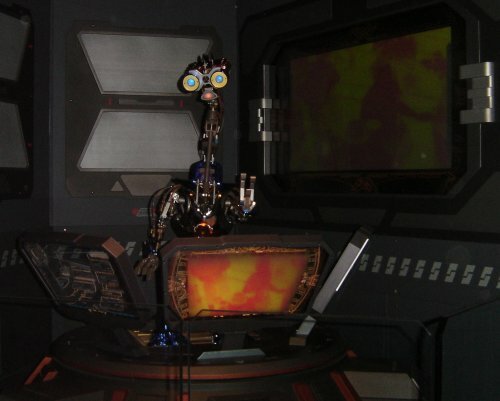 The waiting area for the ride is much the same as it’s been these past 24 years–C-3PO and R2-D2 continue to bicker–but changes reflect our real-life obsession with travel security. Now the addled goose droids**** check baggage for smuggled weapons and subject guests to a thermal scan. It’s all in good fun, though, and part of a story line about a search for a rebel spy which amusingly pays off once the ride is underway. Poor Rex has been packed in a crate waiting for a factory recall that will never come. The ride itself? As much as I loved the original, Star Tours 2.0 sends a proton torpedo right up its exhaust port. It makes the Kessel Run in nine parsecs. It’s all that and a bag of death sticks. What’s different? The film is now in 3-D, and it’s good 3-D. What’s more, the single scenario of the original has been replaced by a randomly-generated sequence which promises more than 50 different combinations*****. * The first was Captain Eo, the 3-D film that starred Michael Jackson from his marginally-less-creepy days. **You know, Anakin’s padawan trainee from the Clone Wars cartoon series. Who is so vital to the saga that she doesn’t appear in any of the live-action films. *** Just as well. He is, I am reminded, a hack and a ne’er-do-well. **** So named because they were originally built out of left-over goose armatures from the defunct America Sings attraction. ***** There are actually only 11 different segments. Here’s a spoilery preview video showing many of them.